The Art Nouveau movement was a relatively short lived decorative and architectural style that was popular during the later years of Queen Victoria’s reign and it is regarded by many as the first modern 20th century style. Art Nouveau evolved from the Arts and Crafts style and still concentrated on the same quality and craftsmanship but with more emphasis on modern materials and technology. Materials such as glass and iron were now being mass produced allowing the Art Nouveau style to be more accessible to the middle class homeowners of the time. The name Art Nouveau came from a Parisian gallery ‘La Maison de L’Art Nouveau’ which opened in 1836 and specialised in this new style. In London it was originally known as the ‘Liberty style’ after the popularity of the Liberty designs and prints of the period. Art Nouveau largely went out of fashion in the 1920’s being replaced by the Art Deco style. Despite this it saw a revival in popularity after World War 2 and again in the 1960’s and is still a well-loved style today. Although there are a number of buildings designed in the Art Nouveau style the main influence was seen in the interior decorations of public buildings and homes. Art Nouveau is a beautifully fluid style influenced by the natural world with designers taking ideas from nature and reflecting them in stained glass, fabrics and wallpapers. Colours were soft and included sage and olive greens, dusky pinks, pale browns and beiges teamed with off-white. Wallpapers and fabrics featured stylized or abstract floral patterns teamed with insects, birds and animals. Poppies, water lilies, thistles, wisteria, peacock feathers, shells, birds and dragonflies in beautiful shades of lilac, violet, purple and peacock blue were all popular. Doors with stained glass panels were often a feature of Art Nouveau interiors. The use of the female form, often depicted with flowing hair in romantic pre-Raphaelite curving poses, were used to form the bases of tall, elegant Art Nouveau bronze table lamps. Charles Rennie Mackintosh – no mention of Art Nouveau would be complete without a few words about this hugely talented and influential Scottish designer. Mackintosh trained as an architect and then studied at the Glasgow School of Art – he later went on to design a new building for the school. Sadly this building was severely damaged by fire in 2014 but much of his surviving work can still be seen in and around his home city of Glasgow. No visit to this fine city should be complete without a visit to the Willow Tea Rooms designed by Mackintosh in 1904. In his later years he moved away from Glasgow and concentrated on painting. Many light fittings are still manufactured today featuring Mackintosh designs. 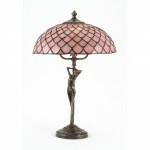 The most well know of these designs is surely the stylised pink rose that features on many a Tiffany table lamp. Emile Galle – French artist Emile Galle was one of the pioneers of the French Art Nouveau movement. He experimented with glass and pioneered a technique of multi-layers of different coloured glass which were then etched away to produce images. Galle’s designs were inspired by nature and often featured floral patterns. Original Galle table lamps now change hands for many thousands of pounds but good quality reproductions can be found at more reasonable prices. 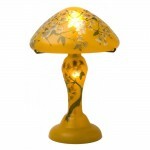 Louis Comfort Tiffany – mention the name of Tiffany and you immediately think of stunning Tiffany lamps and lighting. Tiffany was an American artist and designer who is undoubtedly best known for his work with stained glass in the Art Nouveau style. He originally began designing stained glass windows and came up with the idea of recycling the pieces of high quality art glass left over and fashioning them into beautiful decorative lamps. In its heyday the Tiffany Studios in New York were employing upwards of 300 artisans. 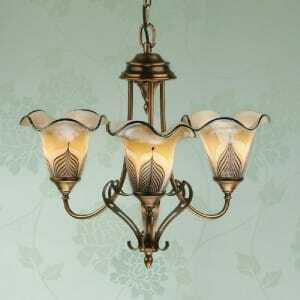 Many Tiffany glass lamps, ceiling lights and wall lights were made in the Art Nouveau style and the enduring appeal of Tiffany lighting has continued to this day. Art Nouveau is a beautiful natural free flowing design style that takes its inspiration from the natural world. It grew out of the Arts and Crafts style but developed its own identity taking the flowers, foliage, insects, and birds and animals used by the likes of William Morris and giving them a more modern stylised look that embraced the new materials of the time. This easy style is well suited to both traditional and modern interiors where it will add an air of elegance to your home. For a true Art Nouveau look keep your decorating plain and uncluttered to create a simple backdrop against which you can display your Art Nouveau lights or decorative objects to best effect. Don’t overdo it though; you are aiming for a few significant pieces. If you have room for only one Art Nouveau designed item then make it an Art Nouveau table lamp – look out for the characteristic gentle flowing lines and motifs from nature. 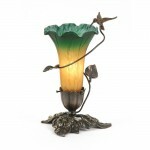 There are many wonderful Tiffany stained glass lamps with Art Nouveau designs depicted in Art Glass. A good quality reproduction Tiffany lamp will be a unique, but still affordable, investment – so find a design you love, look after it and treasure it as an heirloom but above all enjoy it. Alternatively, if Tiffany is not your thing, go for an Art Nouveau table lamp depicting the classic female posing figure or a simple bronze lamp with a coloured glass shade or one of the distinctive reproduction Galle glass table lamps. There are also some wonderful Art Nouveau ceiling lights and chandeliers hand made with Art Glass. The Zina range from our Sandringham Lighting Collection features stunning pale amber glass with delicate feather detailing – these are individually hand crafted shades and there are only a few glass makers that retain the skills to produce glass to this standard today. Hope this has been helpful to you, feel free to share.